The Chinese painting Marshal Xin of Thunder at the Museum of Fine Arts, Boston, is a very large work on silk, approximately twelve feet tall. Dating to the Ming dynasty, it is in poor condition, with many creases, and has been in need of conservation treatment. The size of the painting makes it very difficult to work on, which is one reason I was invited to come to Boston this August to help. Through the MFA’s special project Conservation in Action: Demons and Demon Quellers—which refers to the painting’s subject—the conservators remounted the painting in the gallery, allowing visitors to watch them at work. Among the many reasons that this was an exciting project for me was that it provided an opportunity to work with another team of conservators. I spent two weeks collaborating with Jing Gao, senior Chinese painting conservator; Hsin-Chen Tsai, associate conservator; and Jane Tan Ying Hui, intern from the Heritage Conservation Centre in Singapore. Before I arrived at the MFA, the conservators had already begun to treat the painting. I arrived in time to help them clean it, remove the old backing, and reline the painting. Working on an oversized painting like this requires very good teamwork. To clean the painting, we sprayed water on it and then placed Chinese xuan paper on the surface to absorb the discolored water. This technique of “blotter washing” is an effective and safe way to clean superficial stains. To treat the mold stains found on the back of the painting, we used solvents, which reduced the more difficult stains, followed by washing with water. Cleaning the painting also helped to separate its layers, making it easier to remove the backing papers. After cleaning was complete, we turned the painting face down and carefully removed the old lining using tweezers. Because the painting was so large, we had to work in sections. Each day, we were able to remove one section of the old lining and then immediately attach a new lining. During this process, we found some areas where color on the back of the painting had stuck to the old lining paper. To preserve the original pigments, we did not remove the backing paper but laid it back in place and worked around these areas. If we had removed the old lining, it would have changed the appearance of the image on the front, which would have gone against the mission of our conservation treatment. I found the process of relining the painting to be very tiring. The artwork is so large, and we had to brush across the entire surface. Visitors, though, appeared to be most interested in this step because many had never seen conservators using traditional Chinese techniques. Even though it was hard work, it was very rewarding when we completed the new lining. The experience at the MFA was very special because it was my first time treating a painting in a public gallery. During treatment, visitors could come by and take a look at what we were doing. Docents were available to explain the process so that people who are unfamiliar with Chinese painting conservation could understand our work. I also think that it’s very good for the Chinese painting conservation community to work together on large projects. This allows conservators with different backgrounds to work together, share ideas, and discuss solutions and strategies for conservation. I have learned to deal with new challenges from working on a large painting, and I am thankful for the strong relationship between the conservators at the MFA and the Freer|Sackler. From October 27 to November 7, I have returned to the MFA to help the conservation team apply the final lining to the painting. Follow along with our progress on MFA’s website, Instagram, Facebook, and Twitter. 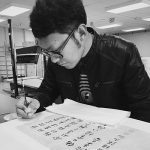 Zhichao Lyu is the Andrew W. Mellon Foundation Fellow in Chinese Painting Conservation at the Freer|Sackler, working with the team of East Asian painting conservators and supervised by Xiangmei Gu, senior Chinese painting conservator. He graduated from Shanghai Institute of Visual Art in China and has continued training in the West for the last several years.